As any kid will tell you, when it comes to having a great time, nothing beats the freedom and exhilaration you feel when you bounce on a trampoline. Not only that, they provide a great cardiovascular workout that can help you lose weight, tone muscles, and is easy on the joints. Therefore, it's not difficult to see why many modern families in the US are plumping to purchase a trampoline to use in their own back yards. With so many different brands and such a wide variety on the market to choose from, trampoline ownership is now within the reach of many families, and you should be able to find something to suit both your budget and your yard space. However, this choice is a double-edged sword. How are we to choose between the different brands? And, most importantly, which provide the best options in terms of safety? Luckily, reviewing the different brands and models of trampolines is what we do best! A brand that's caught our eye lately is Exacme, and you may have heard about their trampolines yourself. If you're considering buying a trampoline from this manufacturer, it's only natural that you'll want to know all the pros, cons and key features of each model they have to offer. So, we've been doing our research and have compiled a comprehensive and helpful guide to the Exacme brand. 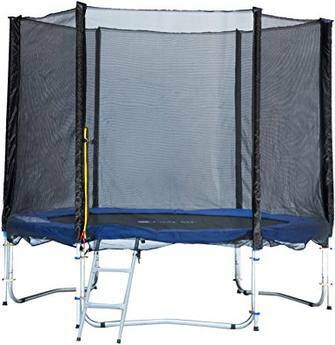 So, read on for our Exacme trampoline review. How is Exacme Trampoline Assembly? How Does Exacme Compare to Other Brands? Where do I Find an Exacme Trampoline for Sale? This is the largest trampoline model that Exacme offer, and if you're looking for a big trampoline this could be the one for you. However, please do not underestimate just how big a 16 foot trampoline really is. Many people assume that bigger is better, and order the biggest trampoline possible without really considering how it will fit into their yard. Before you make such a commitment, measure your yard carefully and make sure you have enough space for the trampoline and the extra safety margin. Also, consider how much of your yard you are really prepared to give up to a trampoline. Galvanised steel frame: This is a great feature as it makes the frame extremely strong and sturdy. Therefore, the trampoline will withstand a long period of heavy use without the pipes bending. Furthermore, galvanised steel is rust-resistant, so your trampoline can be left out in adverse weather conditions without suffering any ill-effects. Heavy-duty springs: These are rust-resistant and will offer an improved bounce action. 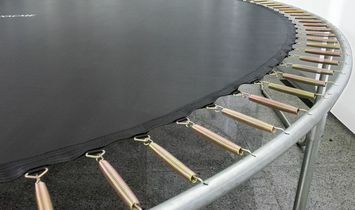 UV-resistant jumping mat: Over time, UV rays from the sun can damage soft components of a trampoline and cause them to perish. Exacme treats their bouncing surfaces to protect them from such damage. W-shaped legs: This model boasts 6 W-shaped legs. Why is this such a good thing? Well, W-shaped legs provide excellent stability to the trampoline and prevent it from moving during use. As you can imagine, any movement while people are bouncing on the trampoline is potentially dangerous. Furthermore, 6 legs is more than many other brands on the market. The more legs, the better the stability of the trampoline. Integrated net safety enclosure: This prevents anyone accidentally bouncing off the trampoline and injuring themselves. Steel ladder: For children, climbing on and off a trampoline can be fraught with danger and lead to slips and falls. A ladder makes a trampoline far more accessible, especially for the younger members of your family. Foam-padded frame: The area of the frame around the jumping mat has thick padding. This is a great feature, as falling on an unpadded frame can cause injury. These smaller models boast the same features as the larger models. However, the 10ft model has 10 legs, and the 8ft model has 3. Unfortunately, at present Exacme don't manufacture a square trampoline. Why might you want a square trampoline? Well, a square trampoline offers the greatest bouncing area for the amount of space it takes up in your yard. 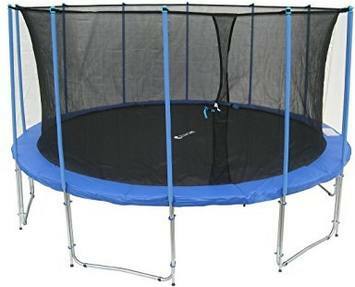 Therefore, if you were hoping to purchase a square trampoline, unfortunately the Exacme brand is not for you. A recent trend in trampoline accessories is a trampoline basketball hoop. This can add extra fun and provide good fun for your family. 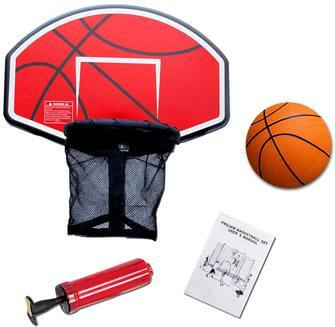 Unfortunately, the few reviews that exist of the Exacme basketball hoop are poor. Users report that it is difficult to impossible to install, and that the foam it is constructed from droops after use. If you're planning to buy a basketball hoop to go with your trampoline, this may not be the best model to choose. Overall, user reviews of Exacme trampolines are positive. Many users have commented that they are high-quality and can withstand many hours of heavy bouncing use. Many users have said that their kids have really enjoyed using the trampolines, and feel they have got good value for their money. Furthermore, most customers say that the assembly of the trampolines is reasonably straightforward, and that it can be carried out quite quickly. The ability of these trampolines is also a highly positive point of these models according to customers. Reviewers say that their trampolines have withstood wind, rain and snow without rusting or diminishing in quality. On the other hand, there are a few negative reviews of these trampolines. 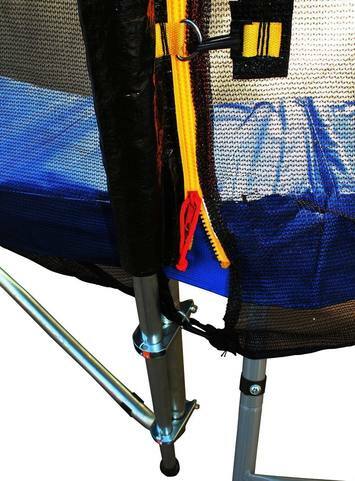 When the reviews are negative, it is often down to the zipper wearing down on the safety net enclosure. Obviously this can cause safety issues as a properly closing entrance is hugely important. After all, you want to be sure your kids won't fall out of the entrance during bouncing, which could lead to a nasty injury. If you purchase one of these trampolines, we recommend regularly inspecting the zipper to check it is still safe. If you feel it is wearing out prematurely and within the warranty period, you should contact the manufacturer. Exacme says that their trampolines are designed to be easy to assemble. Most users concur with this statement, saying that they managed to put their trampolines up quickly and with relative ease. On the other hand, a few users have reported issues with assembly. These are mainly down to the trampoline being delivered without the required parts, or issues with getting screws to line up. With so many other trampoline brands on the market, you'll want to know how Exacme trampolines measure up to the competition before you commit to purchasing one. So, do they stand up to the competition? Read on to find out! One major benefit of the Skywalker brand is that the enclosure net has been specifically designed to avoid gaps that children can fall down. A few reviewers have commented that this can be a problem with the Exacme models. On the other hand, if you're looking for a trampoline with a high weight limit, then Exacme is the way to go. It can accommodate far more weight than the 200 lb weight limit of a 15 foot Skywalker trampoline. Both the Exacme and Zupapa branded trampolines are made from galvanised steel, so whichever you choose you can be reasonably confident that they can withstand heavy use and inclement weather without damage. However, Exacme has one major advantage over Zupapa, and it comes down to the number of legs. The larger Exacme models have six legs as opposed to Zupapa's four, allowing for more stability during use. 16 foot, 14 foot and 12 foot: These models boast a whopping 375lbs weight limit. 10 foot: This model also has a very high weight limit, safely accommodating 260lbs. 8 foot: This has a lower weight limit at 180 lbs. When you buy a trampoline, the fact that some parts may need replacing at some point rarely crosses your mind. However, trampolines usually have to take heavy use and it's highly likely that parts will need repairing or replacing at some point. If replacement parts are difficult to track down, this can cause major inconvenience further down the road. Luckily, Exacme replacement parts can be easily purchased on Amazon. 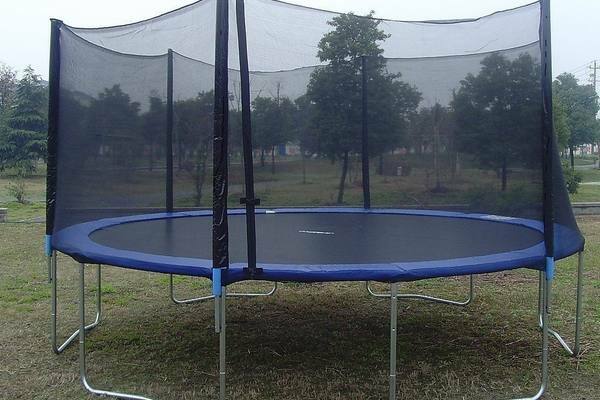 Safety net enclosures are an important component of your trampoline, especially if it is going to be used by children. Exacme trampolines include a net safety enclosure on all of their models as standard. We are pleased to see that they include zip-close entrances, as many other brands use Velcro which is not as secure. This can cause a problem as people could potentially fall out of the entrance and injure themselves. However, as we've already mentioned, some users have said that the zips on Exacme enclosures are not high-quality. So, please inspect the zips regularly to ensure they are still in a safe and acceptable condition. The jumping mat on any trampoline is a key component. After all, this is where the magic happens, as it's the part that you bounce on! Unfortunately, UV rays from the sun can cause premature perishing of the jumping mat. Luckily, Exacme have recognised this problem and have therefore treated their jumping mats to protect them from UV damage. In the event that you need to replace your jumping mat, you can purchase replacements easily from Amazon. We love that Exacme have such a high weight limit, as this allows absolutely everyone to enjoy jumping on their trampolines knowing that their weight can be accommodated. We are also impressed with the attention that Exacme have paid to the legs on their trampolines. The W-shape, combined with the higher overall number of legs, provides far more stability to the trampolines. 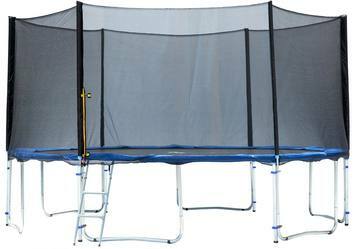 This gives these trampolines a major advantage in terms of stability and safety during use. 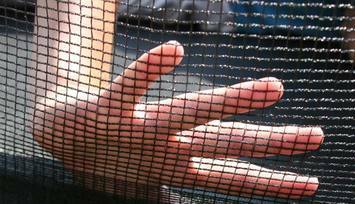 When it comes to safety, the net enclosures on a trampoline are extremely important. Therefore, we are concerned that some customers say that the zips on the enclosure entrance are less than top-notch. A secure entrance is vitally important, as you don't want anyone falling through it and sustaining a nasty injury. To improve these trampolines, we would want to see Exacme addressing this issue to ensure the entrance can be fastened as securely and safely as possible. Overall, having weighed up the evidence we think that Exacme trampolines represent good value for money, and would be a good purchase for many families. This is especially true if for whatever reason you want a trampoline with a higher weight limit, as from this point of view they are the best in the industry. However, before you purchase a trampoline from Exacme, consider the potential issues with the zip entrance as you will need to make regular observations to make sure it is fit for use. As with all trampolines, you should be prepared to examine all components regularly to check they are in good condition and carry out maintenance if necessary. Hopefully, now you've read our Exacme trampoline review, you'll have a clearer idea as to whether an Exacme trampoline is a good choice for you and your family.